Istanbul Museum of Turkish and Islamic Art is housed in the palace built by Suleyman the Magnificent. 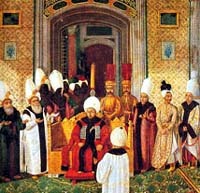 It was the largest of the private palaces built under the Ottomans and is a very good example of Ottoman architecture. The museum has a very rich collection of carpets, Korans from all over the Islamic world and beautiful works of calligraphy featuring imperial decrees and signatures. There are also collections of glassware, earthenware and utility objects in the Museum in Istanbul. The ethnographic section has interesting exhibits of Nomadic Lifestyle as well as 19th century Istanbul.